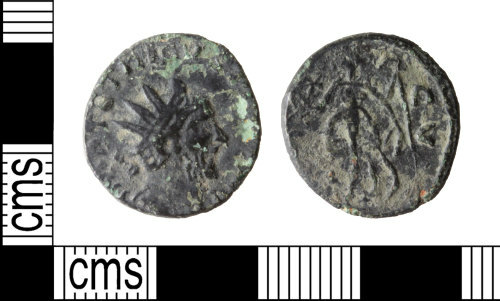 A copper-alloy Roman barbarous radiate copying Tetricus I dating to the period AD 275-285 (Reece period 14). SPES PVBLICA reverse type depicting Spes holding up hem of dress holding flower and walking. Uncertain mint. Reverse description: Spes holding up hem of dress holding flower and walking.